I am constantly surprised by the ever increasing levels of talent treading the boards in “amateur” theatres across the UK. Yes, it has always been good, but I truly believe that the only difference today between the amateur tag and the professional one is money. This was especially evident tonight at Heywood Civic as Rochdale Musical Theatre Company (RMTC) presented the timeless RENT. For those not familiar with the story, as the programme states the show takes us through 525,600 minutes of the lives of inhabitants of Alphabet City in New York, a place where AIDS runs riot through the community. The inhabitants of this notoriously dangerous neighbourhood join forces with the homeless to protest at the loss of their housing to so called property development. RMTC and director Josh Hindle have amassed a spectacularly talented group of performers, many of which you will recognise from the North West musical theatre circuit. The show is led by narrator Mark (Elliot O’Brart), a film maker struggling with self-belief. O’Brart gave a hugely convincing and assured performance alongside HIV positive rock musician Roger (Zac McIntyre) who is desperate for “one glory song” before time runs out. McIntyre is a powerhouse performer displaying his exceptional vocal talents throughout the show. Street kid Angel was played exceptionally by Alex Pembers. I have seen a number of RENT productions over the years and I have to say Pembers interpretation of the drag queen street drummer was one of the best I have seen. “She” stole the show every time she stepped on stage and also had some ambitious choreography, executed perfectly. Angel’s death was one of the visual highlights of the whole evening. Tom Collins (Darren Fricker) who meets Angel on the streets after he is robbed on the street is another character portrayed superbly in this production. Fricker judges his levels of emotion just right, especially after losing Angel who he fell in love with following their first meeting. Terry Banham also provides an assured performance as former room-mate of Mark and Roger turned landlord Benny. Where this production triumphs for me is in its trio of powerhouse women all of which could command the leading lady role in many productions. 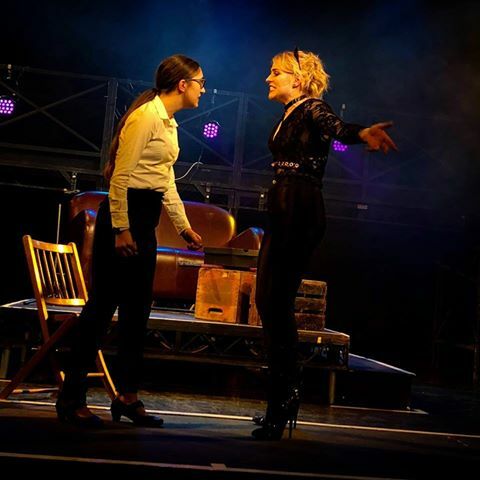 As Mimi, Helen Claire Rose commanded the stage with confidence, a wild child and nightclub dancer ravished by drugs her interactions with Roger were a highlight, and the final scene heart-breaking. Add to this a powerful voice, hugely impressive in every way. Sophie Lord as Maureen is described in the programme as a “hard bilked performance artist with a preference for rubber”. We hardly see Maureen until towards the end of Act 1, but when she takes to the stage she grabs your attention from the first moment. Lord gets to perform, for me, one of the craziest songs in musical theatre, “Over The Moon” a reference to the nursery rhyme “Hey Diddle Diddle”. In the hands of a less experienced performer this song can be a disaster, not so tonight as Lord had the audience mooing along with her at its conclusion. The final piece of this female powerhouse trio is Joanne, a civil liberties lawyer, Maureen’s production manager and partner. Kyanna Cronshaw as with every other cast member pitches her performance wonderfully, I loved her awkwardness and her duet with Maureen “Take Me Or Leave Me” was one of the musical highlights of the show. A sizable ensemble filled the clever stage set well and each and every one of them acted their individual character well. It was clear a lot of thought and work had gone into these roles. Sadly for me tonight the show was slightly let down by the technical side, mainly the lighting. I understood the thought process that had gone into the lighting design and at times it looked stunning. My problem was that the extremities of the stage remained unlit numerous times during the show when action was being played upon it. Also it was desperately crying out for more lighting on the faces of the actors. This was opening night, and I hope this is addressed for the rest of the run. There were also some questionable costume choices, not in keeping with the setting of the show. 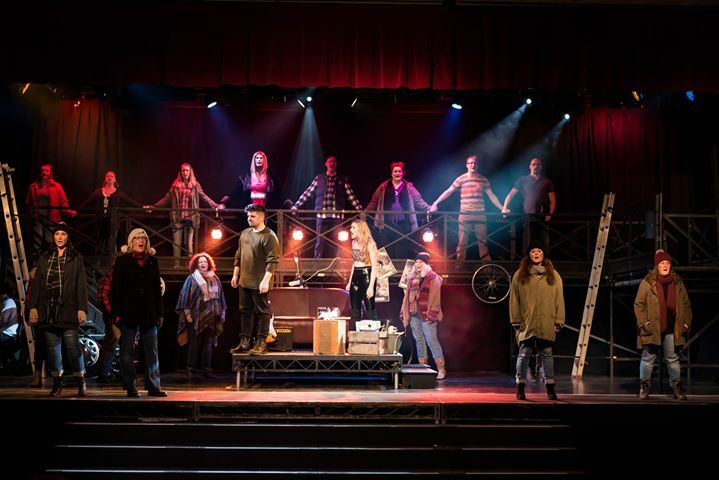 RENT is a brave show to produce, but with a stellar cast and beautifully sounding band under the direction of Lisa Manley this version is a triumph. It is clear director Josh Hindle has put a lot of work into crafting this piece. 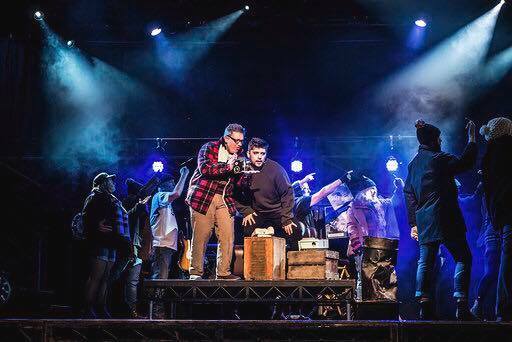 I particularly liked the end of the performance when the cast took their bows in unison, no one performer had an extended time in the limelight, a true community effort, together as one until the end.